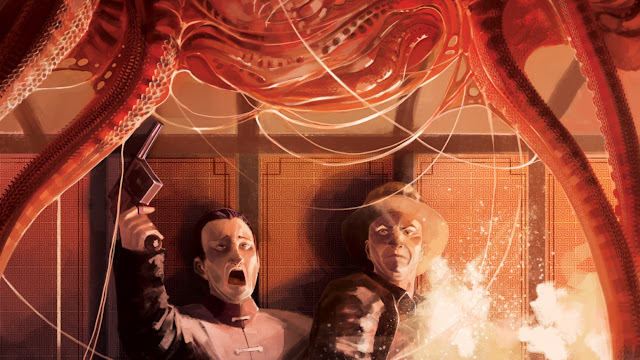 As reported on BoingBoing, Chinese censors have destroyed an entire print run of The Sassoon Files, a sourcebook for Call of Chtulhu that was funded via Kickstarter. We have suffered an unfortunate and unexpected setback with the off-set print run. On March 20th, the Chinese government ordered the destruction of our books. Although the printer returned our deposit, we need to find another printer and this will result in a delay in fulfillment. We are committed to completing the print run and fulfillment. There is a Youtube video explaining more in depth below. A Chinese government inspector must review and approve all print runs, even exported books according to the video. The printer returned the deposit? Sounds like they just didn't want to do the work so blamed the government. I am shocked this has not happened sooner and with some regularity. China will do a lot, if not most things, for money especially if it continues to undermine Western industry. However, they are a communist nation. There is no freedom of speech, press or anything else in the police state. At anytime the CCP could decide it does not like your product and that could financially ruin that party. Support your home country. Every time you do business with China you are rolling the dice. China is NOT a communist nation. It started this way but changed to a capitalist system along the way. The fact that the printer in question IS NOT a public company proves that. And yes, we agree that there is no freedom there. I live in Greece, I shouldn't care where anyone prints anything BUT I always prefer to buy RPG books printed in the USA. The reason is simple; the probability that a worker in the US will be a minor, will work 18 hours straight or will be paid enough just to not die from starvation is extremely low while in China is almost certain. Every time I buy something I make a choice more important than the obvious - I choose a tiny segment of my future. If my only concern is to buy something cheap then tomorrow I might be the cheapest option. The CCP (chinese communist party) is the ruling party, as it has been since 1949, of the people's republic of china - that will be ruled by Xi Jinping until his death. Not to be mistaken with the independent and democratic Republic of China, otherwise known as Taiwan. There is no private businesses in china all people and businesses work for the betterment of the communist party (mandated to do such). There absolutely is private business in China. Things have changed a lot since 1949, and their private sector is now substantial and enormously important. That said, their one-party political system remains what it is. It doesn't make sense to call it capitalism or communism at this point. They refer to their own economic model as "market socialism." They should print in Italy or in the Baltic states. Cheap & reliable. James Raggi seems to have had excellent experience printing in Finland. Finland has a significant forestry and paper industry. Seems Finland (right next to the Baltic states) could also be an alternative.